Early in the day on the 6th of February, I was woken up by a familiar *Ting*. It was a Facebook notification. 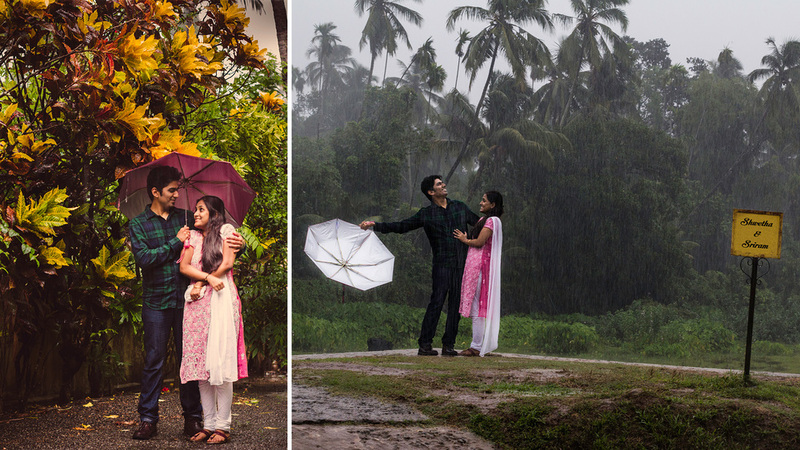 3 months later, I am here with a set of Images from a chaotically beautiful couple shoot in Thrissur that occurred amidst heavy rain (Surprise surprise, it's Kerala! what else did you expect?) and a lovely wedding reception in Chennai. In the 3 months that led to the shoot in may, I spoke several times with Sriram and discussed the possibility of a couple shoot in a location of their choice, we decided it would be best if I can make it to Thrissur for the pre-wedding portraits as time was scarce between the wedding and the reception (No surprises there, either). I found enough time to go out for a walk. Did you know that departmental stores in Kerala have Masala soda vendors? The plan was to go for a drive to some of the scenic places in and around town like Snehatheeram Park, Azhikode beach / Chavakkad beach, Vadakkumnathan Temple and Sakthan Thampuran Palace etc. and photograph at each of the said locations but what ensued was nothing of that kind. It was much better! Though we watched the monstrous rain eat away the precious little time we had, we did it while thoroughly devouring the tastiest of Aviyal Sadham with Vadas served on a banyan leaf. After a while, the rain wasn't worrying us enough to not go out and shoot. We shot just over 20 minutes till the rain came back again, but with an umbrella in one hand and the camera in the other, I was glad to get some good shots. 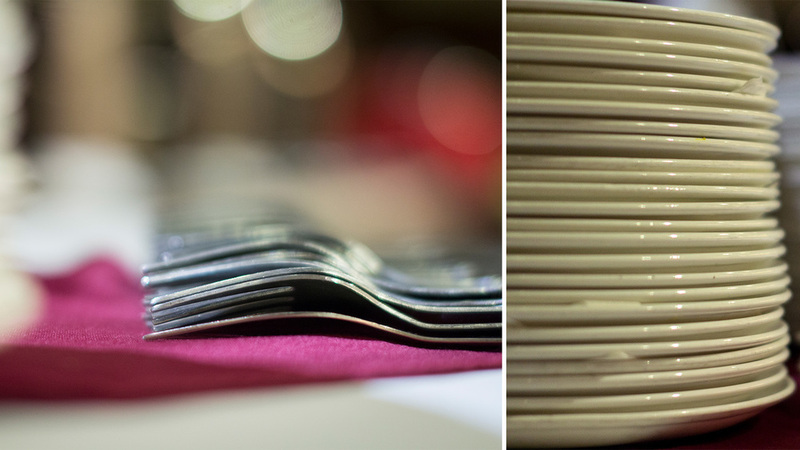 Fast-forward to the next week, and I shot their wedding reception in Chennai...You know what, Let me not ramble on with my words, It's time I let the photos speak for themselves. Do go through the set and let me know what you think. This one is dedicated to Swetha and Sriram, may the both of you have a wonderful married life! 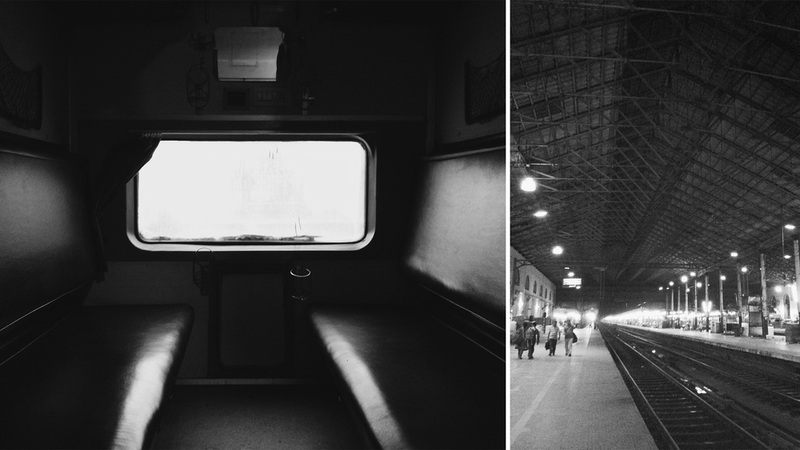 I came back home from Thrissur on a train that was delayed by 4 hours, giving me enough time to have 2 breakfasts at the station. Once I boarded the train, the cabin opposite to me oddly had a Harry Potter vibe to it. Tech savvy guests at weddings!